Haldia is a city and a municipality in Purba Medinipur in the Indian state of West Bengal. It is a major riverport and industrial belt located approximately 50 kilometres southwest of Calcutta near the mouth of the Hooghly River, one of the distributaries of the Ganges. The population in 2011 was 200,762. Haldia is being developed as a major trade port for Calcutta (Kolkata), intended mainly for bulk cargoes. The industrial city has several major factories, including South Asian Petrochemicals Ltd, Indian Oil Corporation Limited (IOCL), Exide, Shaw Wallace, Tata Chemicals, Haldia Petrochemicals and Hindustan Lever, in addition to various light industries. The port has attracted Major International Petrochemicals Companies, like Mitsubishi Chemical Corporation (MCC). Mitsubishi Chemicals has the Second Largest Terephthalic Acid Producing Plant in Haldia. The Haldia Township is bordered by the Haldi River an offshoot of the Ganges River. The riverside in Haldia is a favorite destination for residents and one can see people strolling down the riverside during the evenings. A catamaran service used to operate from Kolkata to Haldia, but was withdrawn due to its high price and a decreasing number of passengers. 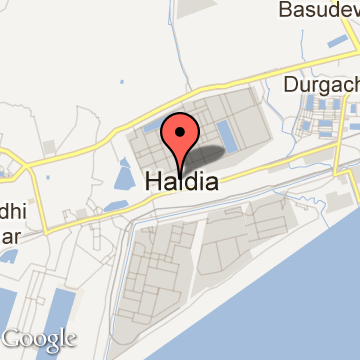 Haldia is also a base of Indian Coast Guard. There is a hoverport to house two of the six hovercrafts belonging to the Indian Coast Guard. It is one of the major ports in India. Haldia Tourism - Get all information on Haldia tourist places and sightseeing tours. Our website helps you plan your next tour and gives you great ideas on what to do, where to eat, where to stay and when to go there. We give the best information from the web to give you precise, meaningful and useful travel guide for leading places to visit in India and from across the world. Our travel information on HALDIA tourist places, tourist attractions, major sightseeing, the best time to visit, the top places to visit in Haldia, the must-see things to see and do, maps, restaurants, hotels, nearby tourist destinations, local public information and more. To start with check out information on how to reach Haldia.